Snowy Dream Siberians results from a child hood DREAM that has become reality. We are a small hobby kennel located in Charlie Lake, British Columbia, Canada. 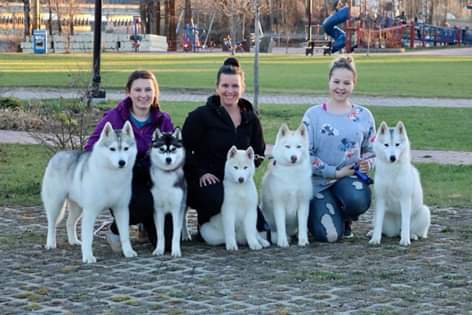 My daughter and I live for the Siberian Husky and our pups have taught us many great things and have shown us many great adventures. We mush in the winter, cart in the summer and do agility. We travel around BC, Alberta and Sask showing for confirmation and Rally Obedience. We have also been to Manitoba for confirmation dogshows. This is such an amazing sport that we truly enjoy. We also love to camp and do it often. Yes, we take all the dogs with us! Our dogs enjoy many things from mushing (sledding in the winter – carting/quading in the summer), swimming, going for walks and being together as a pack! We breed for quality not quantity. We strive to produce dogs who can excel in the confirmation ring, on the sled trails and as family companions. Each dog used in our breeding program meets breed standard, and was carefully chosen by their pedigree, structure, temperament and health. We strongly believe in health testing and ensuring our pups are well socialized. We show our dogs to their championships and beyond and have a lot of fun doing it. Our pups are our passion. We test annually for eyes, and all breeding dogs have their eyes cleared by a Veterinary Ophthalmologist. We do hips at age two on all our breeding dogs and their hips are rated either Good or Excellent by OFA (Orthopaedic Registry For Animals). We also encourage annual eyes on our puppies that are placed in forever loving pet homes which we cover the cost as we take health very seriously and the more information we have of our lines, the more knowledge we have to help further better the breed when matching breeding pairs. We love keeping in contact with puppy homes and enjoy getting regular updates and pictures, we are here for the life of our puppies and are always around to share knowledge and answer any questions our puppy buyers may have. If you have any questions, please contact us and we would be happy to chat with you.